I fear this disc of Mozart’s valedictory masterpiece may fall into the shadow of another (rather different) recording, reviewed above. Such is the peril of taking on such a well-loved work. What is presented here, though, is a very different proposition to René Jacobs’s Requiem, sung by a largely male choir with boy quiristers on the top line, the modern-instrument LMP and the traditional Süssmayr completion with, so far as I can make out, no subtle tinkerings or ‘improvements’. 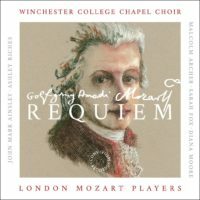 The closest recent comparison, then, is with the Choir of King’s College, Cambridge (7/13), and if it were not for the many extras included in that package, it would be trumped by this new recording. Winchester College’s New Hall offers a far more immediate sound than King’s famous acoustic, so focus on individual voices is keener here, with the basset-horns heard to notably fine effect, especially in combination with trombones and trumpets (in the Benedictus, for example). The choral singers are all well drilled, the soloists blend ideally and the LMP put not a foot wrong throughout. What is missing, perhaps, is a touch of drama: the fugues come across dutifully rather than with a sense of burning conviction, and movements such as the ‘Dies irae’ might have been taken with a notch more determination. Nevertheless, those requiring an all-male-voice traditional Requiem should not be disappointed by a performance which, while offering little in the way of revelation, has evidently been lovingly prepared and presented.